An interview with some organizers of the 3rd North American Anarchist Studies Network conference. The interview touches upon why the conference was held in Puerto Rico and the existence of anarchism on the island. A We cannot speak of a concerted reaction among Puerto Rican anarchists because although there’s an always evolving non-written history of organizing, there isn’t that much of an anarchist milieu going on from where to draw any explicit opinion. Nevertheless, there are certainly some moderately small groups with different agendas, in addition to anarchists in other socialist organizations as well as individualists, who have nodded their heads in agreement, recognizing the importance of opening spaces for the discussion of such thinking on a bigger scale. At first, members of the ad hoc NAASNPR committee presented the project of housing the third NAASN conference to other groups akin to anarchist thought, but since they were mostly focused on other projects it was put on hold. The first formation of the organizational committee structured the foundations of what would be the conference itself (booking the first venue, the call for papers, the announcing of the event, etc.) and eventually other comrades got in touch to help volunteer with issues such as food, artwork, planning, logistics, writing, and transportation, among others. Q The website and organizing you’ve done so far is very impressive. You definitely have a talented group of artists, scholars, activists, and organizers in Puerto Rico. How did you all find each other and what has it been like to bring your efforts together? A It has been great. Even though we have known each other for a while, the process has been an excellent opportunity to bond as individuals. The actual organizational committee is made by two teachers, a farmer, an artist, a student, and a poet. We’ve also had help from people from different backgrounds. Even though our main goal is the conference and we get together at least twice a week to work with it, it also gave us a space to discuss our ideas and create future plans that go beyond the conference. Q Obviously this conference benefits from a history of organizing in Puerto Rico. What previous anarchist organizations or affinity groups have come together to help put this conference together? Do many of the organizing collective’s members have previous experience with anarchist groups? A Even though Puerto Rico has a rich history of organizing and resistance, we have done this without the direct support of any organization. There are members of other collectives or socialist groups that promote the event and spread out the word and will be participating but the organizing aspect has been done by a small group of people. Radio Huelga, a collective that was born as a pirate radio during the strike at the University of Puerto Rico will be working with us to transmit the event live through their webpage. Nonetheless we cannot deny the impact all this history of struggle has had in ourselves as individuals. Even though all of us have been part of past struggles in an individual aspect and only two of us had been part of an anarchist organization, but not for long, we are learning from our interactions with the struggles in Puerto Rico and with the contact with other socialist and progressive organizations. Q In September the original venue cancelled after the Rector of the institution discovered the political leanings of the gathering. How did this affect the organizing? Was it easy to find a new space? Is the AteneoPuertorriqueño more receptive to your politics? A When we first started looking for a venue the options available were quite limited. For practical reasons, the conference had to be hosted within the metropolitan area (San Juan specifically), due to serious problems and deficiencies in public transportation on the remainder of the island, and a lack of spaces with the minimum requirements for the purpose intended. In addition to this, we wanted a space that would be open for the discussion of any political idea so we were looking for spaces outside the academia. Paradoxically, we settled for the Centro de Estudios Avanzados de Puerto Rico y el Caribe because of its convenient location and accessibility for everyone. After a few weeks of phone calls, emails and personal visits we were given the heads up; there was only some bureaucratic paperwork left to do, but we were told anyhow not to worry, and decided to start promoting the conference. When the Rector of the institution found out about the activity they cancelled it on the basis of miscommunication and conflicts with the dates. They said they were having an Art Symposium that was going to last two weeks; out of which we still haven’t seen anything announced, and certainly just a made up excuse for censorship. This put us in a precarious situation and left us back at the beginning of our organizing efforts. After an intense week of searching for a new space we thought the Ateneo Puertorriqueño would be the most appropriate venue for the event. Two things must be said about the Ateneo Puertorriqueño. Even though it springs from liberal ideas, it welcomed us without ever questioning our purposes and was excited to have us there. Even though the Ateneo closes down for the holidays and resume their labors after the dates of the conference, they agreed on opening the space for us within the time span of their holiday vacations, not only for the event, but for the venue’s preparation days earlier; something which was highly appreciated since the probability of getting those same dates on other public or private spaces were null for different practical or cultural circumstances. Furthermore, the Ateneo has been an open forum for all the ideologies that have taken part in the political debates in Puerto Rico, from far right conservatives to the radical left. Being a cultural, educational and historical institution founded in 1876, it receives funds directly from the government but their open politics has won them the hate of the current administration which wants to transfer its yearly pay of $500,000 to a children hospital in the grotesque fashion of putting people who could oppose between the sword and the wall, as if one had to choose between cultural endeavor or agonizing children; using among many of the excuses, the hosting of an anarchist conference; this of course from the distorted cartoonist perspective of being wreck advocates. Even after this attack on the Ateneo (they got already paid) they have decided to keep on going anyway they can, even without the economic support of the government if those funds happen to be withdrawn or transferred. Q It would be beneficial for future organizers to hear from you folks on lessons learned during the organizational process. Do you have any words of advice for next year’s organizers? A Personally, I think this is a product of love. Even though we are all stressed out by our daily lives and the conference consumes more than that we could ever imagine, it is gratifying working with a group of individuals that share your same interest and the hopes of a better future. We have learned that individuals can accomplish anything they want through organizing. Resistance doesn’t have to be boring, let’s radicalize our politics by having fun while creating them. Q Reports of anarchist groups in Puerto Rico circulated earlier this year after major strikes at the University of Puerto Rico. Were any of you involved in this? What is the state of the student movement in Puerto Rico since this spring? How have movements like the student movement contributed to anarchist actions in Puerto Rico? A It could be said that the strike in the UPR sparked the fire of grassroots politics (anarchism among others) in Puerto Rico on the twenty-first century. Each one of us was involved only partially and sporadically on some of the main manifestations like the take over of the university on early April that year, massive demonstrations, workshops, or just roaming around. But were definitely aware of its unfolding, and no matter how it ended, it could be regarded as a victory only to have freed and opened spaces of direct action and interaction (although for a limited time span), until then not available anywhere in Puerto Rico. Groups shaped on anarchist principles took form, some were explicit, others rather discreet, but it was among these ad hoc, non-representative and freely associated groups, in contrast to bigger student organizations where those ideas prevailed. Of course there have always been people who have sympathized with anarchism, but since there was a historical absence of such ideas in political struggles and as a political possibility in Puerto Rico in most of the twentieth century, it wasn’t until then that it was considered as a legitimate stance for most of the people involved. The student movement is out of the media eye but is still quite militant and some of the organizations that were formed during the strike still get together frequently. Some of them are organizing marginalized communities against forced expropriation by the government, others against a new fee that the administration want to implement not to the university students who already suffer from it after the strikes, but for the students of the University High School; among many other fights that overlap in many ways and that coincide in that governments are hazardous for healthy individuals and therefore societies. Q Have you noticed an increasing interest in Anarchism in Puerto Rico? Aside from the Rector, has this convention run into much political opposition? A The apparent grown in actual anarchist thought doesn’t correspond on the whole to a discovery of anarchism as such, but rather to a mutual recognition between individuals with ideas in common. These revelations were due to what we were talking previously about the importance of opening alternative spaces – like the university occupation during the student strikes – where individuals can challenge their roles as random citizens towards each other and bond freely, creating new relationships and spontaneous forms of horizontal organization. It could be said that there has been an increased interest in anarchism in the sense that there were people who had always sympathized with the ideals that anarchism proposes but until then they had always associated anarchism (the word as such) with its distorted pejorative definition. Also, when we hand out flyers or we talk to people on the streets, they are drawn to the ideas because they seem logical to them. The conflict we had with the aforementioned institution and its high bureaucratic hierarchy, although obvious on its rationale, wasn’t a direct statement against the conference and the ideals attached to it. But on the basis of the withdrawal of the Ateneo Puertorriqueño’s funds, there has been a misinformation campaign by an actual governing party legislator with the pretext of it endorsing anarchism, using the conference as its main evidence, and supporting this view on local radio talk shows. Paradoxically (or maybe not), an equally supportive expression of this misinformation effort (and of anarchism’s distorted, pejorative, and hollow definition), has come from the island’s pseudo-intelligentsia, mainly some of its most popular writers and critics, who have been using the term within the vicious circle of the media bubble to denounce the frenzied situation of crime and corruption. Although superficially criticizing government and its actions (even to the point of calling government “the most anarchistic of institutions”; an absurdity not worth discussing – only conceivable by an uninformed bourgeoisie elite), they contribute reciprocally towards the government’s propagandistic agenda and the problems of Puerto Rico itself by cutting short the possibilities of conceiving alternative structures outside the status-quo capable of surpassing the actual state of affairs to most population who have no other “intellectual” reference. Q Are there any historical precedents for international anarchist gatherings in Puerto Rico? Historically, how have Puerto Rican anarchists and radicals involved themselves with international anarchist movements? A There’s no precedent in recent history of an international anarchist, or socialist, gathering in Puerto Rico as far as we know. During the May First celebrations of1900 there was an international meeting organized by the Federación Libre de Trabajadores but there hasn’t been, to my knowledge, an international gathering of people that sympathize with radical ideas. During the first two decades of the twentieth century there was a strong connection with the international anarchist movement as we can deduce from their newspapers and propaganda. For example, when “La Semana Trágica” events happened, there were mobilizations in the area of San Juan in solidarity with the Spanish radicals. There were also solidarity networks with the Francisco Ferrer y Guardia case and a frequent mention of the abuses committed against the anarchists in the United States, Latin America, Europe and Asia. All of this was the product of a wide network created with anarchists from all around the world. This scenario changed after the persecutions of the 1910s in Puerto Rico. Another example would be Max Nettlau’s mention of the local newspaper Voz Humana in his “Contribución de la bibliografía anarquista de América Latina” which lets us contemplate the idea of a transnational network of information in which Puerto Rico took an active part. Also, we need to observe that even though it wasn’t as strong as the early twentieth century, there have been links with other militant organizations such as the Black Panther Party, the Weather Underground and militant socialist organizations. We need to remember that even though Puerto Rico has a militant left, it has been centered around the colonial debate and the independence struggle which, even though it has revolutionary potential, sometimes lacks of a radical approach to the building of a more just society. That’s something we wish to change with the conference. Q What would you say is the value of bringing together anarchists from across North America (and the world) to Puerto Rico? What do you hope to accomplish through it? Are there any new international connections that have been forged through this process so far? A Considering our immediate historical reality, we urgently need that new ideas permeate local radical circles from which therein spring out and defy deep-rooted predominant modes of thinking and outdated frameworks. The radical politics spectrum in Puerto Rico has been dictated and carried out mostly by the conception of an independent state: (synthesizing) at first by multiple forces within the landowners and the working class, then by the now extinct nationalists and afterwards by a long-time agonizing independence party. You can’t expect to change the state of affairs without simultaneously challenging its self-legitimized modus operandi (of both oppressor and oppressed), and understanding that abolishing colonialism within the highly bureaucratic procedures recognized and acknowledged by the colonial authorities is impossible. In addition to this, a fight centered exclusively on colonial issues overviews further problems more proximate to the quotidian, as of how is society going to be structured afterwards; around the dominant group’s ideology at the time, as in revolutions past? We all know that story. We think that the interdisciplinary study of anarchism lets us create other possibilities inside our immediate reality and struggle. Having an international quorum lets us present anarchism as a cosmopolitan idea and it lets us palpate from a more concrete and material standpoint, the sense of solidarity between individuals from different geographical regions, concurrently rejecting the notions of nation-states. All this being particularly significant in the case of Puerto Rico, where a vast percentage of its citizens commonly understands America (not to mention North) exclusively as the United States. Q Up until this point, NAASN has been a predominantly Anglo- (and North-) American organization. I noticed in this year’s selection of presenters, in the website, and in other promotional materials that there is an emphasis on bilingual communication. I personally see this is as a very positive step for NAASN and North American anarchists in general. How intentional was this emphasis on bilingualism? How much of it was simply a factor of organizing in Puerto Rico? Are there other ways in which this conference is trying promote the cross-pollination of Anglo- and Spanish- American anarchist studies? For example, will there be translation services? Will conference papers be accessible in multiple languages? A This has been a major point of discussion in all of our meetings. The emphasis on the bilingual character in the organizing and presenting of this conference has flourished from two significant features: one historical and political, the other aesthetic and semiotic. The former corresponds to the particularity of Puerto Rico being a territory of the US for more than a century; a time span within which at first it was tried to efface out all those remarks that resembled traditional Puerto Rican culture, in an effort of reeducation to prevent consciousness and therefore, patriotic libertarian uprisings. After such failed attempts, English was adopted on a more diplomatic basis as a requisite among language classes in public and private schools. Politicians like to brag about having two national languages, but it is common knowledge that a big percentage of Puerto Ricans barely speak some rudimentary English, if none at all. The latter aesthetic-semiotic aspect is complementary to the aforementioned one. On a practical sense (at first intuitively), it was favored not to translate what NAASN stands for, because it could create confusion based on if the two networks (its name in both languages) were actually the same thing. So it was decided on a semiotic rationale to keep NAASN as the acronym on which to identify the conference itself; like a sort of conspicuous brand name you don’t have to translate for it to accomplish its function in the market, recognized by all individuals notwithstanding their communicational idiosyncrasies. Besides this, English’s compact syntax proves (depending on the purpose) more convenient for graphic design. Summarizing, historical, tactical and technical facets where considered as they rose organically during the procedures experienced upon the consolidation of the event. As an additional note, we didn’t want to constrain anyone’s availability to share his or her ideas due to language issues; even having a few comrades who will be presenting in Portuguese. All of this has represented a considerable challenge since we want to make it the most fluid possible within time limitations; not to mention within our budget in case translators have to be hired. Of course it will be tried to translate as much as possible so everyone can be able to be part of the discussion, but it has been one of the most complex challenges so far. Q At the risk of over-politicizing this interview, I’d like to remark that previous NAASN conference and online discussions have witnessed divisions between academics on the one hand and activists on the other. Has this been one your minds as you organize the third annual conference? Do you see this as a problem this year? A Yes. We wanted to make it accessible to everyone, not only people who are part of the academia. Up until now, most of the people that submitted proposals are in someway linked to academic institutions, but we expect anyway thorough participation from activists attending alike. We have tried to make a different approach but have found a lot of negative feedback. For example, we were attacked through some internet forums in Puerto Rico for trying to organize “another academic conference.” Accusations anchored in that we will be talking about anarchy, but not making or living it; a statement rather poor. It is common sense for us that at some moment the activist have to do intellectual work and educate his or herself, and that the academic must go to the protest, reclaim the streets, or make use of direct action. And there is no contradiction because both features should be at hand in the hypothetical individual. At the same time, having so many foreigners come, we have to give them the certainty and security that the whole thing won’t fall apart, or that it might not happen. It is true that praxis is essential but that doesn’t mean we will be organizing an anarchist holiday in the Caribbean; an abstract “do what thou wilt shall be the whole of the law” event. Responsibility is also an essential anarchist principle. 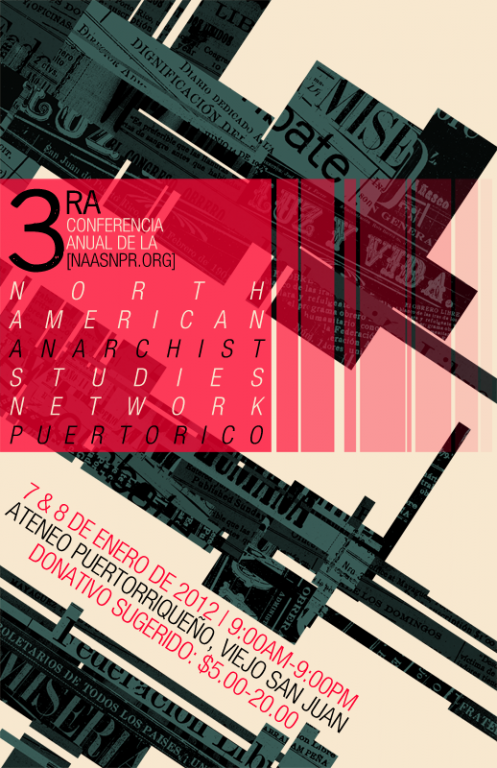 Q What is the state of anarchist scholarship in Puerto Rico? A It is almost non-existent because not only we lack of resources to study it in depth, but have undergone a historical neglect of anarchism as such. There are a few scholars that are working with anarchism but they barely communicate and some don’t even know it is actually happening. From the 1970’s onward up to the late 80’s there was a growing interest in historiography with strong a Marxist dialectic; these important and highly valued investigations wrote the until then scattered whole twentieth century history of Puerto Rico from the working class view. But at some point happened the same as Herbert Read’s intellectual output as explained in To Hell With Culture’s introduction by Michael Paraskos: “…the increasing dominance of Marxist forms of criticism from the 1970’s onward […] left him with an implacable hostile audience” to which he adds “it might be possible to argue that the neglect of Read by later Marxist historians had its origin in this early political difference.” This of course isn’t an attack on Marxism but nevertheless a real fact, not idiosyncratic of exclusively of them, but on the whole sphere of historiography as well. Although consequently in contemporary academic and non-academic circles there have been sporadic efforts and an increasing interest in rescuing that rich ideological heritage that we hope might spread out to be considered equally indispensable. Q What do you see in NAASN’s future? What about the future of anarchist studies in Puerto Rico? From herein we see the dissolution of symbolic frontiers: NAASN as only to designate a geographical framework and not a chauvinistic cultural exclusion as is ironically the hypocrite conservatism case in Puerto Rico. We hope it becomes even more of a cosmopolitan invitation to share ourselves freely across all boundaries – national, cultural, or otherwise – and rejoice as friends, lovers, brothers and sisters, intellectuals and activists, but above all as human beings with all the beautiful dilemmas it entails. Nevertheless we cannot predict what will become of anarchist studies in Puerto Rico for the future; neither out of a gathering of this kind since it has never happened before. All we know is what we can expect of our beings as individuals; all those things we can do to better ourselves and reciprocally enhance our friends, families, and communities. This has been a breathtaking experience that we’ll always carry close to our hearts. Thank you for your interest, and all those who took of their time to read this. For more information on the NAASN Conference, see the website.